weekend class = learning a thing or two about cooking and dining well. techniques, ingredients, recipes projects that definitely need to be tackled on the weekend. the result? weekend-class fare, of course. 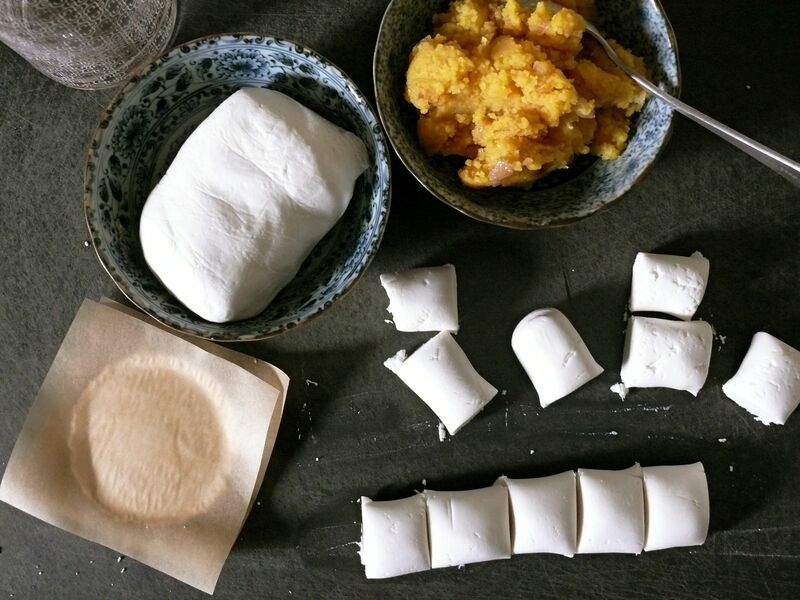 …it’s generally really easy to make your own rice flour dough! That idea is ridiculously exciting to me because, first, look how beautiful your homemade dumplings can be, all plump and shiny, slightly translucent and exactly the texture of the best of its kind at dim sum. And then, think of the possibilities. I didn’t know where I was headed at first with a slightly denser batch I’d made, but I steamed some unfilled rounds of it anyway and ended up with rice cakes, of course! I froze those for a future soup. I’m going to be brave enough next time to steam a sheet of the dough, making it just a touch wetter so it spreads without rolling, to cut into fresh rice noodles. Can you imagine? My accidents led me to the confidence to try that–it’s quite amazing how a little too much air and a little extra water will change the elasticity of this super-glutenous dough drastically. 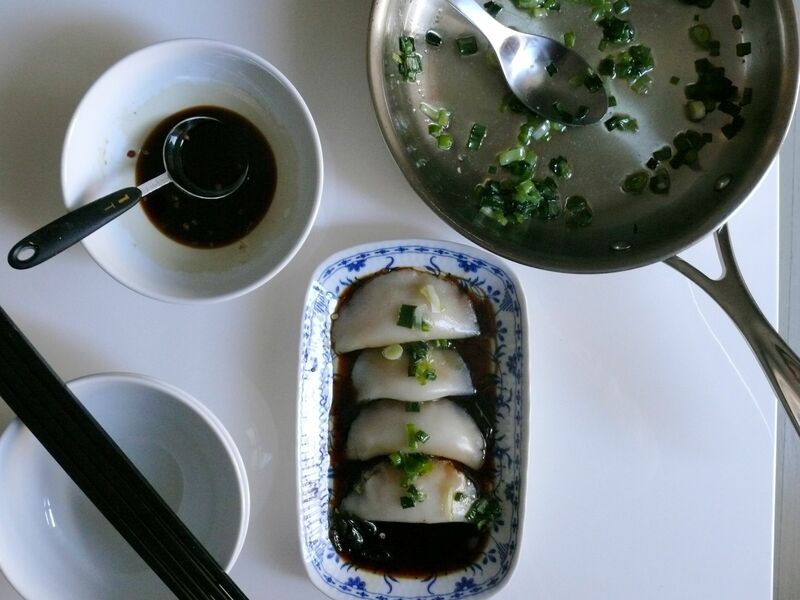 Be warned, made as is below, with mung bean filling, these dumplings are filling. The temptation, since they are so tasty, can be to eat them with gusto, in which case your overstuffed self won’t be doing anything else with gusto for the rest of the day. I speak from experience. Delicious trials and errors. *YS notes: For perfect dumplings, cover any piece of dough that you’re not immediately working with with plastic wrap. Even with that care, work with a quarter of the dough at a time, rather than half, especially if you’re making these on your own, and rather than set the wrappers aside, fill and form them immediately and set them in your steamer so you don’t have to worry about handling a piece or rolled dough that’s had a moment to dry out. Freeze any extras on a baking sheet, then separate stacks of the frozen dumplings with parchment paper between the layers. 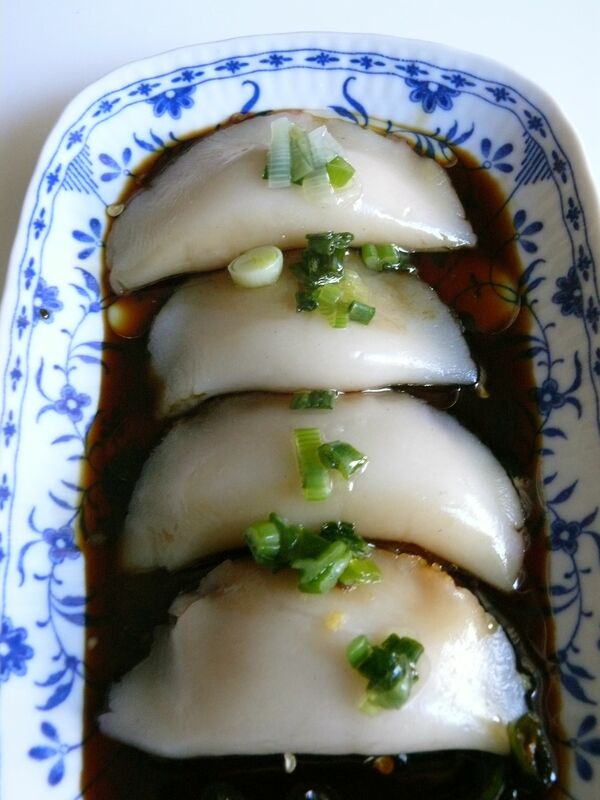 I really enjoyed the mung bean filling but I will definitely try these with a Chinese chive filling next time, and serve with a chili paste, and maybe a minced bean sprout or bamboo shoot filling with a sesame oil dressing. Rinse the mung beans, put them in a bowl, and add water to cover by about 1 inch. Let soak for at least 2 hours. I usually soak them for 2 to 6 hours. Drain and transfer the beans to a parchment paper lined steamer tray. Spread out the beans. Steam the beans over boiling water for 8 to 15 minutes (the shorter time is for the metal steamer and the longer time is for the bamboo steamer), or until the mung beans are tender. Remove the steamer tray and set aside to cool. Or, transfer the beans to a bowl and occasionally stir them to hasten the cooling. Process the cooled beans in a food processor to a fluffy consistency. 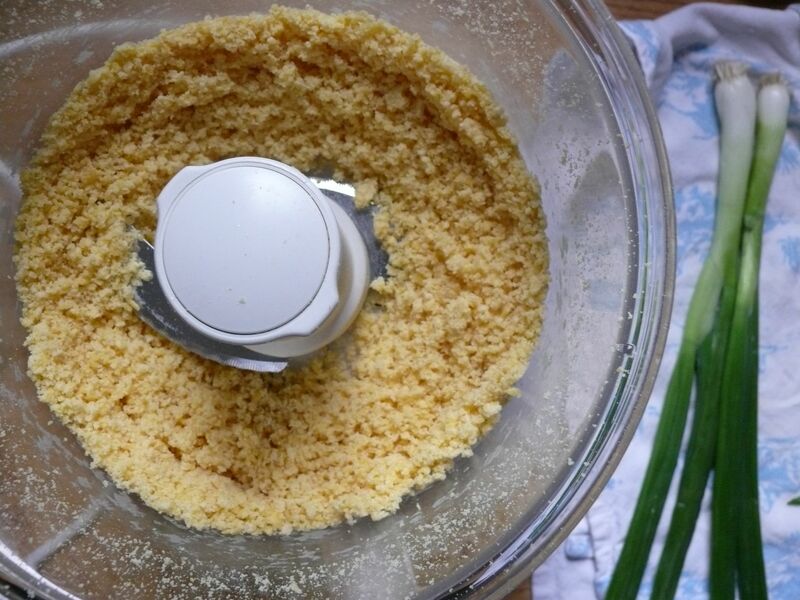 It should look like fine cornmeal but hold together when a small amount is pinched between your fingers. You should have about 1 cup. To prepare the filling, combine the oil and shallot in a small saucepan. Heat over medium heat until the shallot sizzles. Continue to fry for 4 to 5 minutes, frequently swirling the pan to evenly cook, until most of the shallots are golden brown. Remove from the heat and stir in the mung beans and salt. If the filling feels stiff, add water by the teaspoon. Aim for a texture like that of dry mashed potatoes: if you press some between your fingers, it should stick together and leave your fingers slightly oily. You should have about 3/4 cup. Cover and set aside. To make the dough, put the rice flour, tapioca starch and salt in a bowl. Stir to combine, then make a well in the center. Add the water and oil. Stir to combine into a dough. Transfer to a work surface and continue kneading for about 1 minute, until the dough is very smooth and malleable, like soft Play-doh. Cut into 2 pieces and cover with plastic wrap. Set aside for 5 minutes. Meanwhile, stir together the sugar, soy sauce, water, and chile in a bowl. Set this spicy soy sauce aside. Line steamer trays with parchment paper and lightly oil. Set aside. To shape a dumpling, place 1 1/2 teaspoons of filling slightly off center. Then bring up the wrapper to form a half moon. Press the edges closed to seal well. Set in the steamer tray, or on a lined baking sheet. Fill the remaining wrappers before working on the other piece of dough to form more wrappers and shape more dumplings. Steam the dumplings over boiling water for about 8 minutes, or until shiny, slightly translucent, and a bit tacky to the touch. Cool for 1 minute before transferring to serving plates. Spoon on the spicy soy sauce and then garnish with the scallion oil and serve hot. Makes 24 dumplings, to serve 4 to 6. Have the scallions ready in a bowl so they may be quickly added to the oil. In a small saucepan, heat the oil over medium heat until hot. Test the oil by dropping in a scallion slice; it should sizzle on contact. Add the scallions, and stir immediately to expose them quickly to the oil. When the scallions have collapsed and are soft, after about 30 seconds. The garnish will keep for several hours at room temperature. Or, cover and refrigerate for up to 7 days, then bring to room temperature before using. I just love that you would do this. P.S. Weekend steamed buns class…? Inviteeeeee meeeeeee, if so.